Both stations are on the Metropolitan Underground line and are served every 10 minutes, but pay attention to take a train to the right destination. Ticket tip: use Oyster pay-as-you-go. You can shorten the walk in Kings Langley, from where trains run to Euston once an hour on Sundays. Markings: Excellent on the Chiltern Way, reasonably good on the Hertfordshire Way, but I would have lost my way twice without a map. Conditions: About 2/3 m paved, rest on tracks, footpath and the canal towpath. Very muddy in places. Mildly hilly. Landscape: Enjoyable mix of wood, meadows and fields. A few nice views, particularly at start and end. Exit Chorleywood station using the side entrance to the car park from the outwards platform. Walking along the fence, you immediately reach a long flight of steps leading to the high street as the village is much lower than the tracks. Turn right into the high street and follow the direction for about 500 yards as the road becomes a mere residential street after a crossroads. This is a nice suburb with well kept houses and flowers in the front gardens, something you won’t see much on the next walks. You can ignore the three first streets that branch off on the left after the crossroads where the high street turned more modest. Some way after the third street, you will find a public footpath between two houses on your left providing access to the forest. The aim is to continue in the same direction, but now within the forest along the back fences of the gardens. The path is pretty obvious; unfortunately, it may be quite muddy as it is very popular with people walking their dogs. The path is actually marked as a public footpath from time to time; when it finally leaves the garden fences, it continues slowly downwards within the wood towards a subway under the tracks. You should recognise the subway as you used it on walk 16. Cross the subway and continue along the muddy track upwards between the hedges all the way to the busy main road. Crossing the road, aim for the stile with a clear signpost for the Chiltern Way on the right just behind the first house at the corner with the country lane. The public footpath crosses several meadows and finally reaches an other country lane where it passes a few houses. Follow this lane to the right for a few yards but you will soon see the next signpost pointing to a footpath on the left. This path goes slowly down towards Wyburn Wood, but keeps along the edge of the small wood. It then crosses an other meadow and reaches the bottom of the valley near a larger wood. It does enter this wood, turning ahead and left in order to follow the bottom of the vale, and it finally leads you to the bottom of the Chess River valley. Cross the valley straight ahead and climb immediately in the field in front of you all the way to the hill crest. Once you have arrived at the top, you can turn right towards the church in Sarratt Church End; there is a small stile to enter the churchyard. The church looks ancient with old churchyard walls all around, but it is actually a mixed bag: the nave is medieval while the rest was rebuilt in the 1870s. I was unusually lucky in being able to visit as the church is normally closed. After visiting the site, you should go back to the corner of the churchyard with the stile you used to enter. 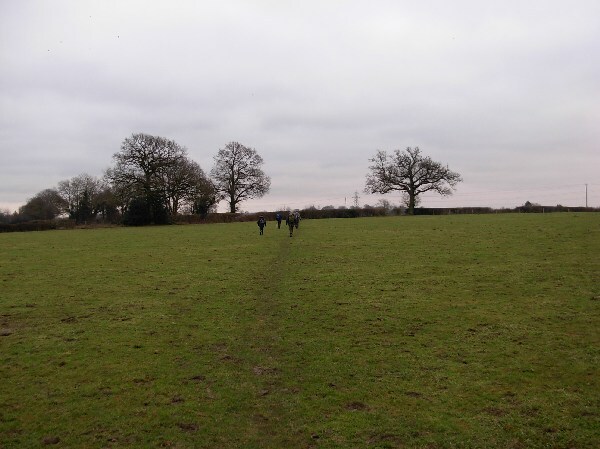 If you now turn your back to the church, you should see two public footpaths, the one to the left being the one you arrived on and the other one being more ahead from your present standpoint. This is the correct direction. The footpath remains on the top of the ridge, crossing a little later on a small wood called Sandfield Wood and continuing past Dawes Common. It feels a little weird to see benches and playground equipment in the middle of such a rural walk. The common is for the use of the residents of Sarratt, a village not so far to your right although you cannot see the houses. 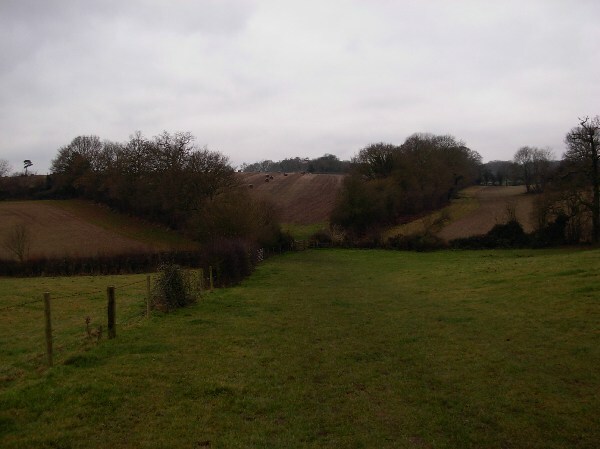 After passing the common, the public footpath crosses a country lane and leads you along the back side of Great Sarratt Hall, an apparently very nice property although you cannot see much of it. Soon afterwards, the footpath reaches Rose Hall Farm, where the owners have decorated their driveway in a slightly pretentious manner. The footpath turns slightly to the left here and ends at a country lane soon afterwards. Turn left on the road to the next bend and then right into a new public footpath. 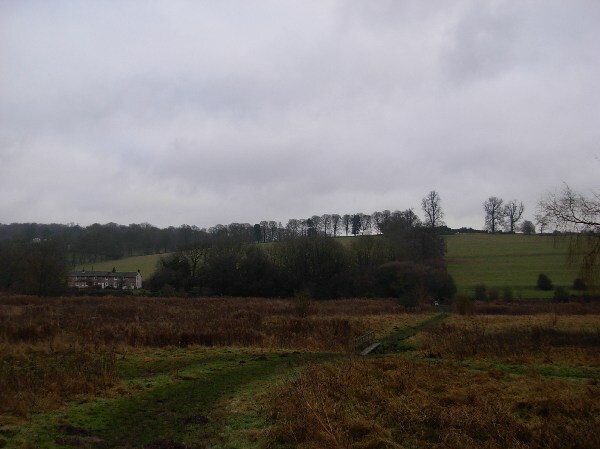 This one cuts conveniently across meadows and comes within sight of the first houses of Flaunden. The Chiltern Way does not pass the village, you therefore turn right into the next road down towards a wood called Hoggitts Bottom. Climb in the wood on the opposite side of the valley and walk along the trees to an important crossing of paths. This is a major milestone in the WAAL as you will be leaving the Chiltern Way here (it turns left on the country lane). You will now be following the Hertfordshire Way for a few walks. I must warn you directly that the Hertfordshire Way is not very well signposted. Some crossings are unmarked and there are never any markings in villages. In addition, the Hertfordshire Way is an oddity as it is the only one-way long distance path I know: it is unmarked in the reverse direction. Although I try my best with descriptions, I think you should definitely have a map on all the remaining WAAL walks in Hertfordshire and Essex. As you probably guessed already, you should now turn right onto the country lane, entering a wood called Hollow Hedge. The road soon begins to turn right and this is already the first place where a signpost is missing. Exactly where the road bends, you should see a forestry track branching off to the left. There is a barrier just above ground level to keep cars from entering. Turn into this track. It will turn right later on in order to leave the wood, passing first Woodmans Farm on the left and then merging into a country lane. Walk left along the road for a few yards to the next crossroads. Take the right branch of the road and you will soon see a signposted public footpath into Chipperfield Common wood. This is initially a large track serving houses at the edge of the forest. Later on, it continues straight ahead as a small path towards a pond. After the pond, the track disappears but you should be able to find a path going more or less in the same direction. This path turns a little to the left. It goes gently downwards to a small bridge over a ditch, twists and turns among the trees and finally exits the wood. You might be forgiven for being uncertain about your bearings; you need to exit the wood at the point where there is branch off the country lane serving a private house. Cross the country lane at this spot, leaving the house on your right, and walk down directly into the vale in front of you. When you reach the bottom of the valley, it is worth pausing a minute to look at the landscape. Four hedges meet here but they all seem to go upwards from this spot, giving an unusual feeling of being well sheltered from the world. You should continue in your original direction, climbing along the meadow towards the next hill crest. There is a farm at some point on your right, but you ignore it and continue climbing through the last meadow all the way to the motorway fence. There is an obvious pedestrian bridge so that you can cross the motorway. Continuing still in the same direction as public footpaths often do in open landscapes, you will go downhill again and finally reach a large farm and a major road. Turn right along the road for about 200 yards and walk to the roundabout with an other road branching off to the left. Do not take this road itself, but take the side road on the left as it goes down along the embankment towards the canal. Turn right here to pass underneath the larger road. If you are in a hurry, you can cross the first footbridge over the canal, continue along the canal for a little bit southwards to a large fence and turn left at the fence along a public footpath through an industrial area. Ignore the rubbish that seems to accumulate in such places and continue up the footpath as it leads you directly to Kings Langley station. Beware that trains run only once an hour on Sunday. There are actually two villages called Langley: Kings Langley was part of the royal domain under the Plantagenet kings while Abbotts Langley just further south is primarily known as the presumed birthplace of pope Adrian IVth. He was pope from 1154 to 1159 and holds the distinction of having been the only English pope ever. If you are in less of a hurry, do not cross the canal and continue on the towpath southwards. 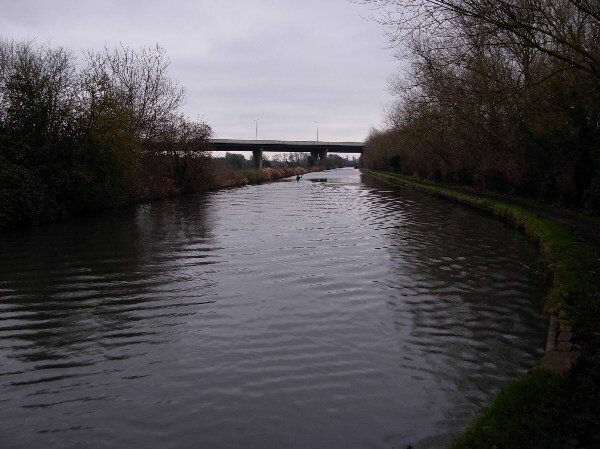 The start of this section is not really exciting as the canal runs straight as an arrow for quite a while until it passes underneath the M25 motorway. The viaduct is pretty impressive considering that the valley is not exactly a deep gorge. I suppose the viaduct was necessary because the valley bottom is marshy; this would explain why the old coach road from the 18th century also avoided this section. 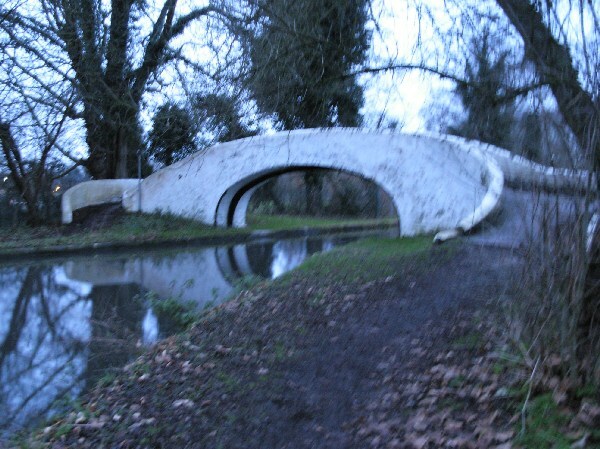 After the viaduct, the canal comes closer to the river Gade near a village called Hunton Bridge. 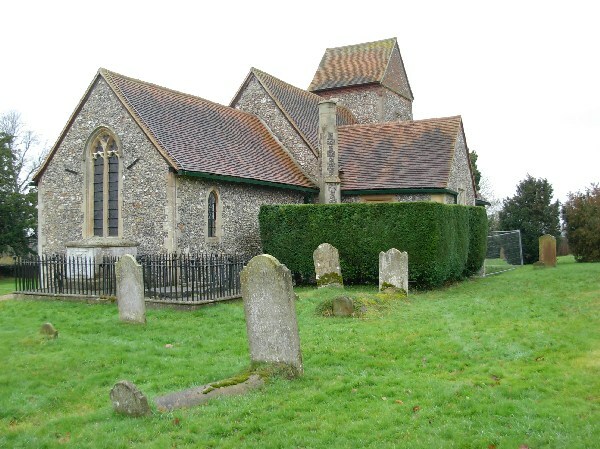 You will be passing near the former school and you also have a charming view of the church in its pretty churchyard. This is actually a Victorian building of no particular interest. Continue along the canal towpath as it passes underneath two road bridges. The canal now becomes more interesting as it undergoes two sharp bends with a lovely footbridge for the towpath between the two bends. The reason why the towpath switches to the east side is that the west side now belongs to Langleybury Manor. The house was built around 1720 and was later converted into a school and recently into a luxury development. You actually have some views of the manor looking to the brow of the hill on your right. The access road to the manor crosses the canal via an impressive bridge with stone balusters. On your left, you begin to see more houses as you are reaching the suburbs of Watford, but there is no reason to leave the towpath at this point. You will soon reach the next lock near Grove Mill; the site has a long history as a mill is already mentioned in documents from the 13th century. On the west side of the canal, you have some limited views of a serious mansion, The Grove. It was built in the 18th century and is now a golf clubhouse. Around 1840, The Grove was the residence of the Earl of Clarendon, Foreign Secretary over a good part of the second half of the 19th century. He had a very distinguished career, having been Ambassador to Spain, Chancellor of the Duchy of Lancaster, Lord Privy Seal, President of the Board of Trade and Lord Lieutenant of Ireland. A good result for someone who was directly in charge in many controversial situations: the civil war in Spain, repealing the Corn Laws, the Great Famine in Ireland and the Crimea war. Grove Mill itself has been converted in luxury flats and this is typical for this section of the walk as you will be passing a number of seriously nice properties, certainly the poshest part of Watford. 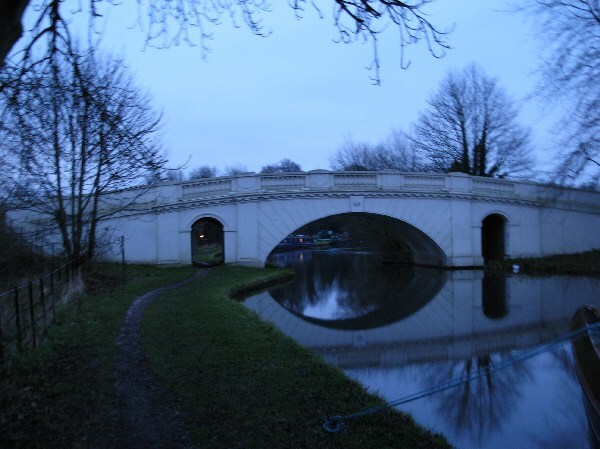 Continuing along the canal, you will reach a bridge giving access to Cassiobury Park, a very large green space bought by the borough when the estate was sold off and the manor demolished in 1927. You could cross the park on your way to the station, this being particularly advisable if you wish to end the walk to Watford Junction station. To achieve this, you need to exit the park at the highest point near the tennis courts. 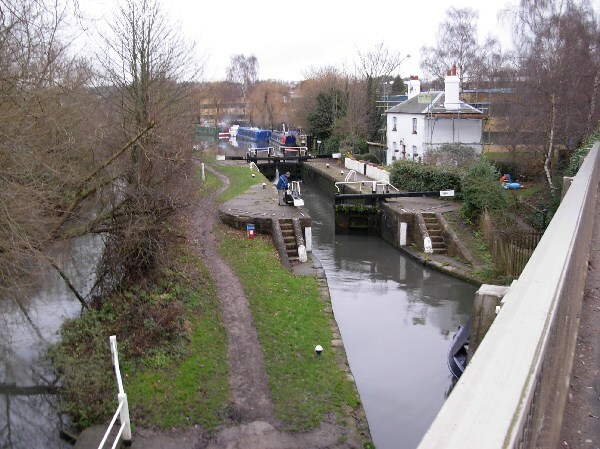 If you decide to go to Watford Metropolitan station (this being nearer), you should continue along the canal to the following bridge and cross then to a charming footpath that meanders through a marshy nature reserve. The path comes out of the canalside wood directly into a suburban street at the foot of the viaduct bearing the underground tracks. Turn left into the street and continue in the same direction for 10 minutes; this will bring you to Watford station. This station is served by London Underground, Metropolitan line. There are two other train stations in Watford, Watford Junction for fast trains to London Euston or Clapham Junction and Watford High Street for Overground trains calling all stations towards Wembley Central and West Hampstead. This rather cumbersome situation is the kind of thing that does happen in England. Cassiobury Manor’s owner did not want steam trains to pass near his property because of the noise and dirt. As a result, Watford Junction is rather far away from the old town centre. Watford High Street is served by a very steep bend in the tracks and cannot therefore be used by normal trains. Actually, it was built as a London Underground station (on the Bakerloo line) although it is now operated by London Overground. Watford Metropolitan (officially called plainly “Watford”) has a track connection with Watford High Street that has been disused since 1996. It would be relatively easy to re-open the line, but no financial agreement could be found between the three authorities involved in the decision: London Underground, being ultimately financed by the London boroughs, is very reluctant about spending money outside of Greater London. Herfordshire County has no powers to build a railway (unless Parliament would empower them) and Railtrack is not involved as this would be a London Underground extension. You will be arriving too late in Watford to enjoy the city, but you might find some additional information interesting. I read it all at the borough museum. 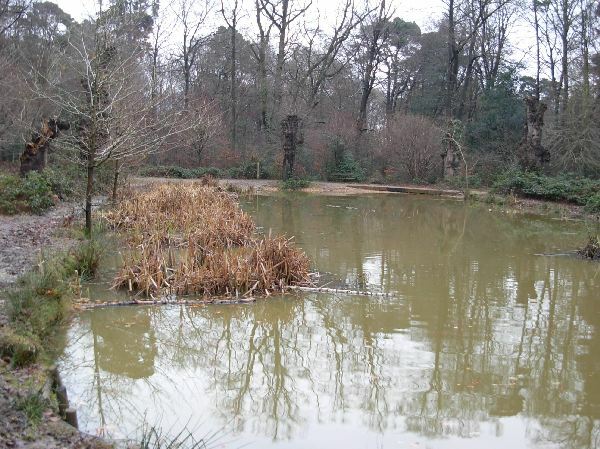 Watford began to grow seriously in the mid-19th century because of breweries attracted by the reliable water of the river Colne. By the mid-20th century, the main industry was printing with Watford being the largest producer of printed material in the world (the museum has a good display of printing machinery with interesting explanations). Since the 1980s, the industry has closed but many large companies have opened administration offices as they are cheaper than offices in London but still very well served by train lines and motorways. The city now has about 75,000 inhabitants. I found the choice of shops on the High Street very lacklustre, probably a consequence of two huge shopping centres full of the usual branded outlets having been built. The only historical monument is the parish church with a few memorials to the lords of Cassiobury Manor, the Earls of Essex. This entry was posted in WAAL Walk All Around London. Bookmark the permalink.